Excellent Insulation Effect: Excellent quality makes this lunch bag be a good insulator. It will keep your lunch warm. It's a perfect lunch container to pack your food. Waterproof materials, no leak issue anymore. Premium Quality: We use high grade polyester for ultimate durability. It will stand the test of time and the fabric feels very soft. It's lightweight and comfortable, its shoulder strap won't scratch your shoulder. Fanshion Design: The appearance of a gray camouflage series makes it fashionable and not vulgar. Good look makes our bag can store items for more than just a lunch bag. If you plan on an hiking, or camping trip or just casual daypack, this backpack is also a good choice. 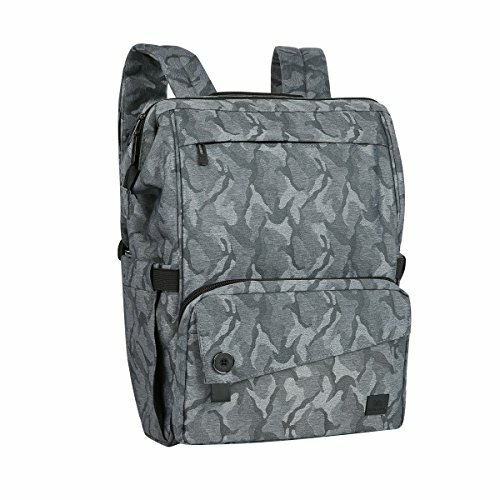 Practical & Convenient :It's lightweight and comfortable, two big central compartments and 13 pockets make this lunch bag backpack can be more reasonable for personal items and suitable for your trip. It's also can be folded to save space. Washing Easily : Stains can be easily washed away. The excellent material makes it easy to clean and dry quickly. Reasonable design makes sure your food doesn't fall into the bag easily.